Helena Chemical has partnered with the NJ Department of Agriculture to promote a free program, recycling plastic pesticide containers for Atlantic County. This program is offered to agricultural, professional and commercial pesticide applicators, along with Helena Chemical customers who hold NJDEP pesticide licenses. Also, state, county and municipal government agencies may participate. One core credit will be given to pesticide license holders who follow the few simple processing steps below and bring their license with them at time of collection. Helena Chemical will accept non-refillable, high-density polyethylene #2 (HDPE) containers that are no larger than 55 gallons and that have been triple rinsed. You must make sure containers are dry inside after they are rinsed out and either cut a 6-inch slit in the bottom or drill a quarter-inch hold in the bottom of the container to insure it will not hold liquids. Lids must be removed. Foil seal also must be removed. Containers that are 30 gallon size must be cut up into 4 pieces using a sawszall, chainsaw, circular saw, etc. 55 gallon containers must be cut up into 8 pieces accordingly. Non-waxy cardboard also will be accepted during this collection program, since most of these products are sold in cardboard boxes. The cardboard must be flattened and must be tied. Collection of cardboard will take place every Friday from 1 to 3 p.m. from April through October. Helena Chemical will not accept containers if they have held any type of petroleum oil product or antifreeze. Pesticide containers with any liquid or dried residue will not be accepted. No mini-bulk, saddle tanks or nurse tanks will be accepted, as they may be made of fiberglass. 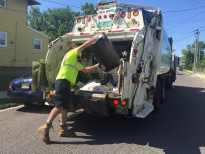 Karen Kritz, Recycling Program Manager from the New Jersey Department of Agriculture will be on-site at each collection to insure containers are prepared properly and to issue one core credit to those who qualify.